The VG Fast Charger was developed from feedback from world championship racers and designed for expert R/C car drivers. 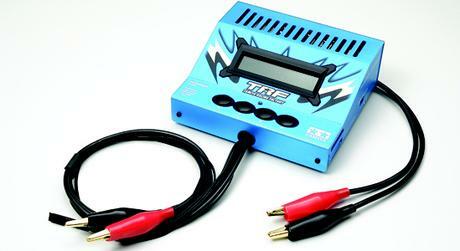 TRF (Tamiya Racing Factory) recommended charging programs (3 peak-charge, 3 step-charge) are pre-set, and the high resolution 16bit AD converter provides accurate voltage reading. The charger features cycle charging to check the cells" matching and performance in addition to adjustable current rates of 0.1-10.0 amps for charging and discharging. The VS charger is easy to operate and has two cooling fans for stable charging performance as well as a black LCD and a LED indicator for clear information display. Protection systems also ensure safe charging operation. Thermometer sensor: 15-70 degrees C.